Based on the same 32nm production present on AMD's mainstream A-series APUs, the FX chip, geared towards the enthusiast, uses a modular approach to CPU design. Each module packs in two processing cores, and AMD is able to pair up to four modules to create an eight-core CPU. You'll also be seeing four- and six-core models released in the coming months, too. Though each module is home to two cores, AMD has saved valuable space by sharing a number of resources that would otherwise be separate, as is the case with the Phenom II X6 chip. In FX, two cores share what's known as the front-end of the processor - fetch and decode stages - and, further, both use a single floating-point unit. This means that two-thread performance isn't quite as impressive as for a chip using two distinctly separate cores, though AMD has boosted the front-end throughput by making the chip a 'four-wide' design. There's give and take here, clearly. 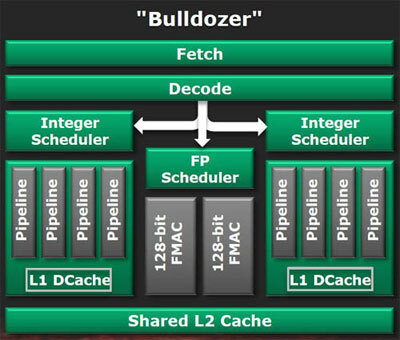 Keeping the module fed with easy-access data is 2MB of shared L2 cache, supplemented by a further 8MB of L3 cache shared amongst the modules that make up an FX processor. Memory support comes by way of ubiquitous dual-channel DDR3 memory, now updated to an official speed of 1,866MHz. And AMD keeps the FX architecture up to date with provision for a new instruction-set that speeds-up applications which use AVX and AES extensions - a few media-processing and encryption apps use AES to good effect, incidentally. Modern chips are able to run past their factory-clocked speeds in circumstances where the overall power budget (aka TDP) permits. AMD guarantees that each FX processor can 'Turbo CORE' to some degree, while also commenting that the new-and-improved power-management features enable half the cores to run at even-higher speeds. The actual Turbo/Max frequency is dependent upon the chip. And the use of new power-management technology - where individual cores can be practically switched off when not in use - necessitates a new socket for the chips: AM3+, which is backwardly-compatible with older AM3 processors. AMD's enthusiast-orientated 990FX chipset is the first to feature the new socket, so prospective purchasers need to bear this in mind when evaluating upgrade costs. From October 12 onwards, AMD and its retail partners, will sell the FX-8150 and FX-8120 CPUs, to be followed by a bevy of six- and four-core models. The FX-8150, priced at around £200, uses four modules for eight-core computing. Clocked in at 3.6GHz and guaranteed to Turbo to 3.9GHz, the specifications look impressive on paper. The cheaper FX-8120 uses the same architecture but reduces frequencies. Bear in mind that all FX chips are multiplier-unlocked, meaning they can be overclocked easily - 4.5GHz isn't uncommon using premium air cooling, according to reports. AMD's gone down a path with Bulldozer from which there is no turning back, so while there's nothing intrinsically horrible with the new FX line, given the price, the balancing act of die size, modules, cores, speeds, IPC and power-draw - the facets which define a modern processor - aren't nearly as impressive as hoped for. This line of thinking is underscored by genuinely sub-par performance in older apps. The FX series will doubtless improve as updated benchmarks and compilers begin extracting more performance from the architecture. Honestly, though, that's a dangerous argument on which to base a current purchasing decision. One needs to carefully weigh up all the options before laying down cold, hard cash. AMD's FX, then, is something of a curate's egg: there's undeniable good laced with some bad.